Achieving a superior high school band program requires commitment from students, educators, parents, and boosters. It also requires the financial support of generous sponsors. 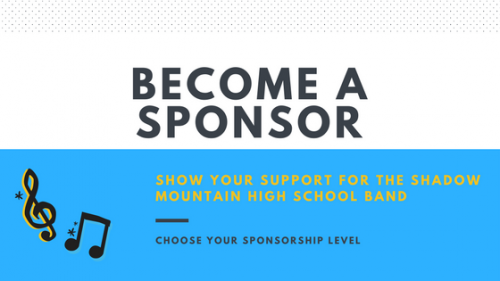 For these reasons, we ask for the assistance from our community of local businesses in ensuring the future of the band programs at Shadow Mountain High School by becoming sponsors. Sponsors can choose to participate at several different levels, including the $1,000 “Platinum Sponsor” level. Besides becoming a patron of the arts, band sponsors will enjoy tangible, practical benefits, too, such as the band booster loyalty, recognition on this website, recognition in our weekly newsletter, and on the Marching Matadors equipment trailer. We’ll also provide an official certificate of appreciation that sponsors can display at their place of business. Instead of asking businesses to contribute several times over the course of a year, we will be asking the business to contribute only once under this corporate sponsorship program. † Band Trailer logo dimensions and placement determined by band boosters.